1 Rinse and trim the beans. Then cut the Romano beans diagonally into 1 cm (approximately 1/2-inch) wide pieces. Cut the green beans into 3 cm (approximately 1 1/4-inch) long pieces. 2 Peel the carrots and turnip and cut into 5 mm (approximately 1/4-inch) cubes. Rinse the zucchini, dry and cut into 5 mm (approximately 1/4-inch) cubes. 3 Peel the onions and chop finely. Rinse thyme. 4 Add 1/3 of the olive oil to a heated pot. Sauté the onions for 5 minutes until transparent over medium heat. 5 Add the remaining prepared vegetables and cook for 3 minutes. 6 Pour in broth, add thyme and bay leaves and bring to a boil. Cook for 20 minutes. 7 Cut the stems from the tomatoes. Dip tomatoes in boiling water, remove, shock in cold water and remove the skin. 8 Cut tomatoes into quarters, remove seeds and chop coarsely. 9 Peel the garlic and chop coarsely. Rinse basil, shake dry, pluck leaves and chop coarsely. Chop anchovy fillet finely. 10 Puree tomatoes, garlic, basil and remaining oil into a coarse paste with an immersion blender. Add the anchovy fillet, mix and season with salt and pepper. 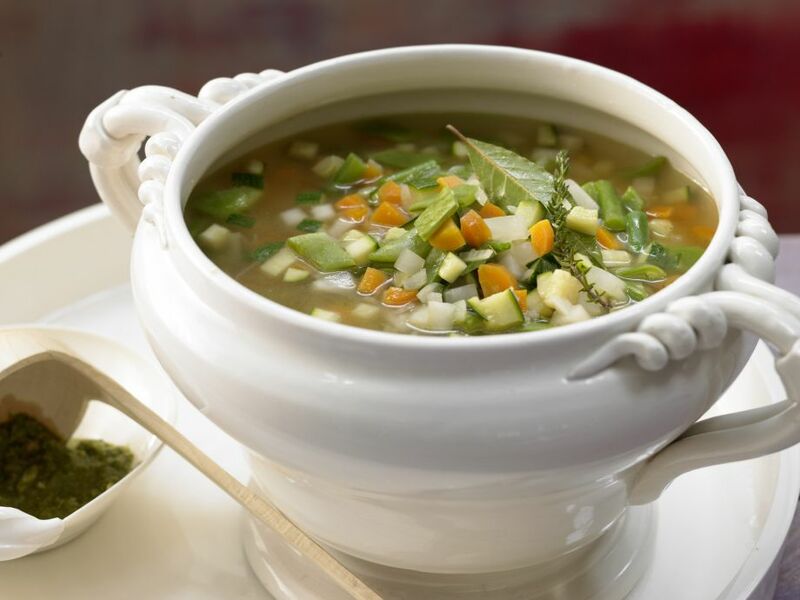 At the end of the cooking time, taste the soup again and adjust seasonings. Put soup into bowls and serve with the basil paste.